You can still place your Avon Campaign 03 2016 Backorder until Wednesday, January 13, 2016. Browse the brochures below, pick the items you wish to order (by item number) and Click Here! to enter your order. The order form will open in a new window so you can refer back to the brochure. You will have to select which campaign the item number is from to get the correct price and availability. Thank you for shopping my Avon website. Campaign 3 brings some love for valentine’s Day. Yes I know it’s not even Christmas yet but I sell ahead a couple of brochures to help Avon know what’s going to be selling hot next month. Someone has to help figure out how to stock the warehouse. Not to mention the Valentine items are always great Christmas items with all the beautiful jewelry and fragrances. Avon did not disappoint this year. The CZ Infinite Romance Ring, sizes 5-10 has a beautiful sparkle. Will be $29.99, Now on SPECIAL, only $19.99. The Signature Brilliance Picture-Perfect CZ Studs are Cubic Zirconia, only comes in pierced. Lots of sparkle. Comes in Rose Goldtone or Silvertone. Will be $19.99. SPECIAL $5.99 each pair. Or pick a set. The CZ Elegance Necklace and Earring Gift Set comes with 16 1/2 “L with 3 1/2” extender, Diamond Necklace and Pierced Earrings, 3 1/2 ct total diamond weight-equivalent CZ’s. Will be $29.99. SPECIAL $16.99 for the set. They are all beautiful, sparkly and at an Avon price. Who doesn’t want to dazzle for the holidays. 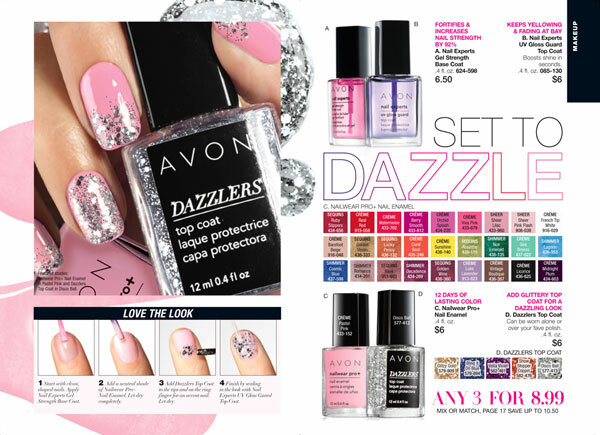 Avon Dazzlers Top Coat will make it happen. You can use it just at the top of the nail, cover the entire nail, use it with or without a color polish underneath or just play with it and create your own pattern. Dazzlers comes in gold, silver, blue, violet, copper and disco ball. REGULARLY $6. SPECIAL ANY 3 FOR $8.99. This deal is mix or match so grab some Nailwear pro or strengthener with this deal. Winter means dry skin for most of us. I have an idea. Skin So Soft Bath Oil (comes in soft & sensual, signature silk and original). Just a little in your bath gives you the softest skin. If you haven’t tried it, you really should. If this isn’t quite enough by itself, add some body lotion; same fragrances plus supreme nourishment. All these are Bonus size by the way. REGULARLY $13 for lotions and $18 for Bath Oil. ALL ON SPECIAL BONUS SIZE FOR ONLY $9.99 That would be half price on that Bath Oil. This is sale you were waiting for.